Once modest champs of the grunge underground, SEETHER have risen through the ranks of AOR to become trusty rock venue fillers. Some would argue this commercial favorability has come at much cost to their original sound and there's evidence of that claim on the trio's latest album, "Isolate and Medicate". Sometimes AOR yields a few nice surprises, which can be found on "Isolate and Medicate", but in the end, AOR is AOR and the album suffers its fate accordingly. Returning to the console following SEETHER's previous album, "Holding Onto Strings Better Left to Fray", Brendan O'Brien (producer of PEARL JAM, SOUNDGARDEN, STONE TEMPLE PILOTS, KORN and RAGE AGAINST THE MACHINE) engineers a clean-sounding, mostly sanitized affair that'll please the band's core audience. Shaun Morgan, Dale Stewart and John Humphrey are permitted to let the dogs loose on occasion, but the proverbial script hovering atop this album sacrifices the few moments of integrity "Isolate and Medicate" establishes. "Same Damn Life", the best track on the album, starts off like a giddy WEEZER outtake with its roll-along verses, but soon toughens up with a catchy yet snarly chorus. Afterwards, "Words as Weapons" treads close to radio rock, but the monstrous riffs divvied by Shaun Morgan and Dale Stewart, plus the marching-spilling drum attack from John Humphrey keeps the song rough around the edges. Again, agreeable choruses guided by a compelling blend of crooning and agitated throat nudging from Morgan keeps an appreciable honesty to the track. Unfortunately, SEETHER wrecks their momentum with the NICKELBACK-esque "My Disaster", an appropriate title for a lazy song that sounds like the band was forced to record it with guns pointed at their heads. It's predictable and blasé, but the real offense comes later on the album as SEETHER practically covers NICKELBACK's "How You Remind Me" with their own self-aggrandizing lyrics on "Nobody Praying for Me". SEETHER attempts to blossom their pedestrian ballad "Crash" with bursts of shoegazing guitars through the choruses and their lead-ins. The omnipresent chugs on the verses of "Suffer it All" and Shaun Morgan's chucking screams are countered by oppositely sweet choruses and the scheme works well enough. These moments represent authentic creativity, since the remainder of the album opts to lollygag through cookie-cutter FM rock standards. Again taking a leaf through the WEEZER playbook on "Watch Me Drown", the effect is nowhere near as fun or interesting as "Same Damn Life", and it comes off as fatigued, leaving a sense of lethargy that hangs over the remainder of "Isolate and Medicate". Sidebar, is Shaun Morgan trying to toss in a subtle James Hetfield homage on the tails of "Watch Me Drown"'s choruses? As the album limps to close, a lurking feeling of what could've been is unavoidable, that is, unless you're an AOR addict. 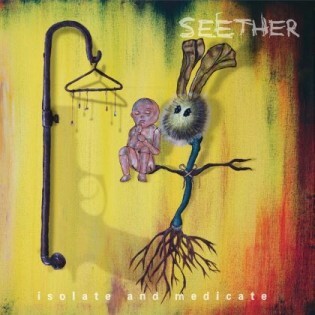 "Isolate and Medicate" shows SEETHER trying to roll after more than a decade and a half in the life, but it presents a case of identity crisis, since it's apparent these guys are capable of writing pretty kickass stuff if left to their own devices. Sad to say, much of this album is a cop-out. Like Shaun Morgan sings two tracks into the album, the band is living the same damn life and it's a shame.